The Flow cytometer aboard the RV Simon Stevin research vessel monitors phytoplankton in the Belgian Part of the North Sea on a near-continuous basis. Monitoring phytoplankton in the Belgian part of the North Sea on a near-continuous basis can yield valuable information on the ecological status of these waters. The use of a flow cytometer can improve this understanding and increase the efficiency of analyses and reporting. Flow cytometry is a commonly used technique among biologists to study temporal and spatial changes of phytoplankton species composition and abundance. It creates fingerprints of particles (phytoplankton cells) based on their ability to scatter or re-emit specific wavelengths of light. This light is detected by sensors and by analyzing fluctuations in brightness it is then possible to derive information about the physical and chemical structure of each individual particle. Images and cytograms of cultured phytoplankton species. In the framework of LifeWatch, VLIZ put a CytoSub flow cytometer (Cytobuoy) into service. It is installed on board in the laboratory space of the RV Simon Stevin and is connected to its continuous water flow system. The instrument is designed to analyze the naturally occurring size range from small (e.g. picoplankton) to large (e.g. colonial) plankton species (1 to 800 µm). In addition to its ability to gather flow cytometric data, the instrument can also take pictures of individual particles. This can allow for easier identification of particle clusters. The embedded computer of the CytoSub is connected to the network of the RV Simon Stevin, which allows off site operating the instrument via a remote desktop connection. Three different sampling protocols (pr1, pr2, pr3) are used: (1) A first protocol with low pump speed and low FL red smarttrigger: for measuring pico-, nano- and microphytoplankton. The pump speed in this protocol is 2 µl/s for 6 minutes. (2) A second protocol with high pump speed and high FL red smarttrigger: for measuring nano- and microphytoplankton. The pump speed in this protocol is 6 µl/s for 6 minutes. (3) A third protocol specifically aiming to collect sharp pictures: a low pump speed of 0.49 µl/s is used for 6 minutes. 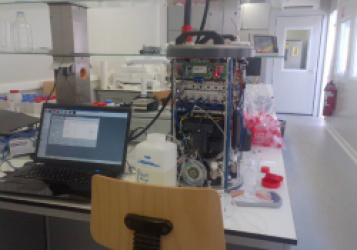 The flow cytometer and associated LifeWatch data infrastructure is being used in the joint research activities of the H2020 Jerico Next project. High-throughput flow cytometric data generated during the RV Simon Stevin campaigns are automatically processed with Easyclus LIVE©. Results are transferred via the ship’s satellite connection and visualized online. Left: total red fluorescence plot - Right: scatter plot of clustered particles. In addition to using the flow cytometer in function of general sampling campaigns, the instrument can be employed for a wide range of applications in the field of marine science. E.g. the screening of phytoplankton cultures, detection of harmful algal blooms (HABs), detection of microplastics and others. [abstract] Artigas, L.F.; Karlson, B.; Brosnahan, M.; Claquin, P.; Creach, V.; De Blok, R.; Debusschere, E.; Deneudt, K.; Gómez, F.; Grégori, G.; Hébert, P.-A. ; Kromkamp, J.; Lefebvre, A.; Lehtinen, S.; Lizon, F.; Louchart, A.; Möller, K.; Poisson-Caillault, E.; Rijkeboer, M.; Thyssen, M.; Seppälä, J.; Stemmann, L.; Veen, A.; Wacquet, G. (2018). Automated in vivo approaches for characterizing HAB in coastal waters: the Jerico-Next European Research Infrastructure, in: ICHA 2018: The 18th International Conference on Harmful Algae: From ecosystems to socio-ecosystems, 21-26 October 2018, Nantes, France. [abstract] De Blok, R.; Nohe, A.; Tyberghein, L.; Deneudt, K.; Mortelmans, J.; Gkritzalis, T.; Sabbe, K.; Vyverman, W. (2016). HPLC-pigment fingerprinting for long-term monitoring of coastal phytoplankton, in: Mees, J. et al. (Ed.) Book of abstracts – VLIZ Marine Scientist Day. Brugge, Belgium, 12 February 2016. VLIZ Special Publication, 75: pp. 34. [abstract] de Blok, R.; Tackx, M.; Maris, T.; Meire, P.; Vyverman, W. (2016). Phytoplankton response to environmental changes in the Scheldt estuary, in: Meire, P. (Ed.) Book of abstracts: ECSA Local Meeting 2016. Estuarine Restoration: from theory to practice and back, University of Antwerp, Antwerp, Belgium, 5-9 July 2016. VLIZ Special Publication, 77: pp. 28. [abstract] de Blok, R.; Tyberghein, L.; Mortelmans, J.; Sabbe, K.; Vanhaecke, L.; Vyverman, W. (2015). Near real-time monitoring of coastal phytoplankton, in: Mees, J. et al. (Ed.) Book of abstracts – VLIZ Young Scientists’ Day. Brugge, Belgium, 20 February 2015. VLIZ Special Publication, 71: pp. 39. [abstract] Tyberghein, L.; de Blok, R.; Mortelmans, J.; Deneudt, K.; Gkritzalis, T.; Declerck, J.; Hernandez, F. (2015). Improved technology facilitates new scientific opportunities: Implementation of an on-board flow cytometer as part of the LifeWatch marine observatory, in: Mees, J. et al. (Ed.) Book of abstracts – VLIZ Young Scientists’ Day. Brugge, Belgium, 20 February 2015. VLIZ Special Publication, 71: pp. 134.